The paper reports the results of an experimental program carried out for establish a method for detecting the resonances that contribute to turbine blade fatigue failures. The proposed method combines modal analysis and integral order trend evaluation of the vibrations measured by accelerometers on stationary parts; it is expected to be especially useful in situation in which classical experimental approaches have short life or suffer limitations due to high temperature environments. 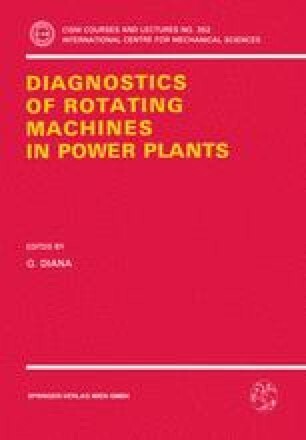 In order to verify and implement this diagnostic technique, several tests have been carried out on a large scale test facility based on a two stage steam turbine. Strain gauges sensors mounted on twelve blades of the second stage provided a check for the presence of blade resonances, while accelerometers located at different positions on the housing were used to verify the signal attenuation along different propagation paths. A computer controlled real time system has been used to acquire, analyze and display data.